It has often been said that the world revolves around oil, that oil is the lifeblood of the global economy. Entire cartels have grown up around drilling and refining oil, and preparing it for consumption by the world’s ever-hungry economic machine. But the sentiment that oil is the world’s lifeblood is not entirely true. Electricity is, in fact, the lifeblood of the global economy, and oil has historically been the most convenient means to that end. That convenience begins and ends with storage. There have always been alternative means to generating electricity — solar, wind, geothermal, hydro, etc. — but you can’t exactly store sunlight or wind. The only alternative has been to store the electricity generated by these alternative means, which, again, has been quite inconvenient when compared to the ease of storing oil. Lately, however, alternative energy’s storage problems have found a convenient and workable solution: lithium. It’s the world’s lightest metal, and it just happens to be a crucial component in lithium-ion batteries — an effective storage solution for electricity. What’s more, with world leaders increasingly turning to alternative energy sources, demand for electrical storage and lithium is projected to skyrocket. And that poses a problem for the lithium market … and an opportunity for investors. Lithium-ion batteries aren’t exactly new. They’ve been used in cameras, toys, cellphones, cordless tools, etc., for ages. But these devices use a small fraction of the amount of lithium that Tesla Inc. (Nasdaq: TSLA) uses to power one of its Model S cars. In fact, fully electric vehicles consume considerably more lithium for their batteries than even the popular hybrids that have gained popularity in the past decade. Foreseeing this trend, Goldman Sachs dubbed lithium “the new gasoline” in a report to clients back in December 2015. It was clearly on to something. According to the latest figures, global lithium demand is expected to increase by three- to fourfold by 2025 as demand for larger lithium-ion batteries surges. And the market is already preparing production to meet that demand. China has plans to build factories capable of churning out more than 120 gigawatt-hours of battery storage per year by 2021. According to Bloomberg Intelligence, that’s enough batteries for about 1.5 million Model S vehicles. And Tesla won’t be the only automaker vying for a slice of the lithium market. Toyota, Daimler, BMW and, recently, even Volvo have committed to eventually moving all production model cars to electric or hybrid models. That’s a lot of lithium. It’s enough demand to push the metal into its own bull market. But there could be extenuating factors that shove the lithium bull market into overdrive. Canaccord Genuity recently set projections at 687,000 tons by 2025, while UBS is expecting demand to hit 873,000 tons in the same year. Tianqi Lithium is one of China’s largest producers of battery-grade lithium carbonate and derived lithium product. The company is already spending about $400 million to build a new lithium plant in Kwinana, Australia, but Thick notes that it would require about “20 or 30 plants of the size we are building in Kwinana, and the mine resources behind that to back it up…” in order to meet projected demand. The problem with investing in lithium is that the metal is not traded conventionally. There is no lithium futures market, and prices are set via contract between producers and suppliers. The only way to access the coming lithium boom is via the companies that mine or produce the metal. There are a few such companies with stocks tradeable in the U.S., including Australian mining firm Orocobre Ltd. (OTC: OROCF) and Sociedad Química y Minera de Chile SA (NYSE: SQM). Meanwhile, FMC Corp. (NYSE: FMC) and Albemarle Corp. (NYSE: ALB) both deal with processing and manufacturing lithium for commercial usage. 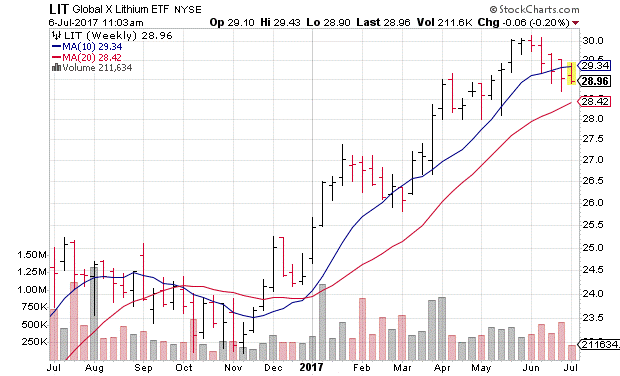 If you’d rather take a broad-based approach to the lithium sector, there’s an exchange-traded fund for that: the Global X Lithium & Battery Tech ETF (NYSE Arca: LIT). As you can see, LIT has been in a solid uptrend since November, riding rising demand for lithium as production ramps up for electric vehicles — especially Tesla’s new Model 3, which is rolling off assembly lines this week. There has been a breakdown for LIT since its May highs, which correlates with recent tech sector valuation concerns. However, this doesn’t change the fact that lithium demand is rising at a clip that will surely outstrip supply. In short, this recent dip may be a buying opportunity. For more investing strategies for lithium and similar metals, be sure to check out my colleague Matt Badiali’s service, Real Wealth Strategist. Editor’s Note: The rarity of precious metals helps drive their value and potential significance to your portfolio. However, you don’t have to rush to metals. EverBank has unearthed an exciting and equally rare investment alternative. Available only with the non-FDIC insured Metals Select® Unallocated Account, this is a rare opportunity to utilize dollar-cost averaging to grow your metals ownership from one month to the next. Start mining at your pace today. Learn more and view more important disclosures here.